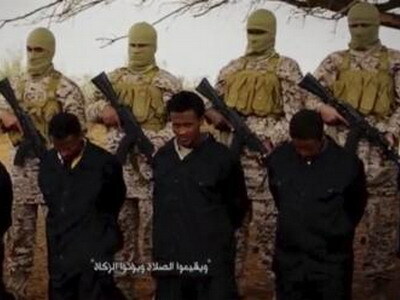 A video purportedly made by Islamic State and posted on social media sites on Sunday appeared to show militants shooting and beheading about 30 Ethiopian Christians in Libya. Reuters was not able to verify the authenticity of the video but the killings resemble past violence carried out by Islamic State, an ultra-hardline group which has expanded its reach from strongholds in Iraq and Syria to conflict-ridden Libya. Both groups of men are referred to in a subtitle as “worshippers of the cross belonging to the hostile Ethiopian church”. Libyan officials were not immediately available for comment. Ethiopia said it had not been able to verify whether the people shown in the video were its citizens. Militants professing loyalty to Islamic State have claimed several high-profile attacks on foreigners in Libya this year, including an assault on the Corinthia Hotel in Tripoli and the beheading of 21 Egyptian Christians in February. The video concludes with a warning that Christians will not be safe unless they embrace Islam or pay protection money.